Like stars, stripes and light beer, Ellsworth Kelly was distinctively American. It’s not because the red of Blue Green Red recalls the Colorado Plateau, or that the green is the kind of green you see on a key lime pie in a diner off of some great but lonely American highway. Kelly was a New Yorker. He was a New Yorker in the time of paint-flinging Jackson Pollock, and out-there color fielders like Mark Rothko. These were artists exploring and defining abstract expressionism, the first purely American genre of painting. In fact, the whole movement put New York on the art world map, giving Paris a run for its money. Kelly was an artist that took the genre those few steps forward. He wanted to explore the possibilities of shape and color as forces that were tied together, in very much the same way a flower and pollen are related, existing together, always, a fact of nature. Kelly’s shapely formulations were inseparable from their colors. He wanted to provide his artworks with the sensation that they were on par with the real forms that had inspired them, that they could stand toe-to-toe with the tree as some physical thing existing in the universe. With all this in mind, it is still difficult to read Blue Green Red visually. Critics have described the painting as a landscape, and Kelly himself didn’t turn such an interpretation down. The blue ellipse could be a raincloud about to burst upon arid country. It could be a lake. To be fair, it might also be a blown-up portrait of a UFO or a disembodied eye. What’s important to note is the use of color and geometry. Kelly leaves almost no trace of brushstroke, allowing for a flat canvas where the depth of field is provided by the interplay of color. Blue Green Red does not have to be anything more than this. There does not have to be any meaning beyond the experience created through looking at a medley of color and form. Yet, this begs the question: why did Kelly prioritize the colors within the title? Perhaps a more accurate title of the painting would be Blue Ellipse, Red Rectangle, and Two Green…Non-linear Functions? 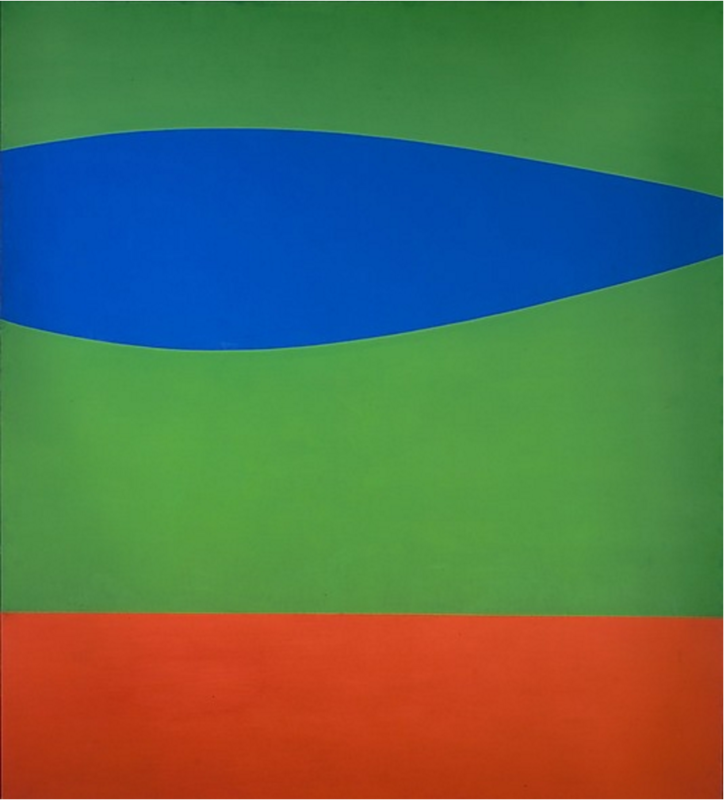 Whatever the green shapes may be, Blue Green Red's artistry is an experience unlike others. Give in to the colors, and let go. Kelly, Ellsworth, Neal David Benezra, Madeleine Grynsztejn, and Julian Myers. Ellsworth Kelly in San Francisco. San Francisco: San Francisco Museum of Modern Art, 2002. The 20th-Century Art Book. London: Phaidon Press Limited, 1996. Rose, Barbara. American Painting: The 20th Century. Ed. Alexis Gregory. Skira, 1969.